ConservativeHome's ToryDiary: Did Obama really brand David Cameron "a lightweight"? Did Obama really brand David Cameron "a lightweight"? Today's New Statesman contain an article (not yet online) in which it is suggested that after meeting David Cameron in London in July, the now President-elect described the Tory leader as "a lightweight". "On meeting Cameron, Obama was, according to diplomatic sources, “distinctly unimpressed”, contrary to some reports (excitedly spun by the Conservatives) which suggested that the two men had formed an instant “bond”. Instead, I have been told, Obama exclaimed of Cameron after their meeting: “What a lightweight!” He apparently also asked officials about Tory Euroscepticism. Soon, word about the rather awkward encounter between the two self-professed candidates of change made its way quietly round the upper echelons of Whitehall." If this is true, I find it astounding that it has taken nearly six months to reach the public domain. Furthermore, the video footage of the two men at that meeting suggested to me that the pair were not only very comfortable in each other's company (unlike the Brown/Obama encounter) but, dare I say it, that they could do business in the (now highly likely) event of them both leading their respective countries in the not too distant future. It's not like him to make comments like that, he's diplomatic to the core. I wouldn't accuse the NS of making it up, but it's probably the end result of 6 months worth of Government Chinese whispers. Doesn't sound like he has anything to go on other than hearsay, and Jonathan is right that it doesn't ring true. Anyone who listened to Obama's utterly vacuous Berlin speech is bound to wonder which of the two men is a lightweight. Just shows that Obama is a good judge then. Not a shred of truth in it, for the very reasons you gave Jonathan. In fact I am surprised that the NS didn't go further and insinuate that Team Cameron were unimpressed with Obama, perhaps with just the smallest hint that the Conservative Party were racist? As we get towards 2010 (or whenever Brown has the courage to go to the country), we'll see a lot more of this sort of stuff and it will nastier too. Who cares if Obama doesn't like Cameron! When the time comes they will have to work together regardless. To my memory only two leaders genuinely liked each other, Maggie & Ronnie, the rest manged to work together some how. I hear you shout "what about Blair & Bush"! not the same, not even close. So this issue has taken some months to come to the top of Lord Mandy's in tray, it certainly would be his 'form'. We should resist the temptation to barrack Obama as this is the obvious cheese on the spring loaded trap. Coincidentally: James McIntyre: Canada's Worst Poet, the Chaucer of Cheese. When George W Bush was elected, the Clinton/Gore "attack dogs" James Carville and Paul Begala took a conscious decision to ignore his being the first US President with an MBA, and branded him "stupid", a tactic that took off amongst the unthinking liberal media/ comedy light weights. The same has happened with Sarah Palin and we have an unsourced suggestion that she did not know that Africa was a continent. Having just read vacuous nonsense by the Editor of the Times and someone called Ben Macintyre, I find myself saying "Who cares ?" about Obama. He is President of the USA elect who is going to need friends after 20th January - just as George Bush found 294 after taking office and US passenger jets destroyed the World Trade Center. It does not matter whether he likes or admires Putin or Merkel or Sarkozy or Cameron or even Brown - he simply has to live with it. Roosevelt did everything he could to destroy the British Empire - Churchill did everything he could to preserve it. One of the many pre-election smears you can expect from the Labour dirty tricks operation. Obama is massively overated, is bound to disappoint, and judging by his ludicrous remarks on Kenya, appears to carry a chip on both shoulders. As for the lightweight charge, it takes one to know one. The "unthinking liberal media" for this story was Fox News Chief Political Correspondent Carl Cameron who said "she didn't know which countries were in NAFTA, and she didn't understand that Africa was a continent, rather than a series, a country just in itself." Unthinking media, I'll grant you. Liberal - Fox News? If you think so you are off the visible light of the political spectrum and deep in the cosmic waves. As for this article - is Cameron a lightweight? Absolutely - you just have to listen to the drivel he comes out with after the meeting. He even says "meet with" instead of "meet" because he is so easily influenced. So, it rings true that Obama might think it, but I can't imagine he'd say it in this fashion. If he did, he's a decent judge of character. I would take Mr McIntyre's sources of 6th hand gossip with a pinch of salt. Thanks, Martin - I have noticed Governor Palin as the latest victim of this "all Republicans and right of centre people must be stupid" thing (Reagan, Quayle and W). From here, it looks as if Obama is just a marketing campaign who has brought back a lot of Clinton advisers - and he, if he does, calls Cameron a lightweight? What is the saying about people in glass houses? Obama being the lightweight he is, is probably doing the same trick as brown in that when he sees someone that contrasts and show's up his own weaknesses he will then accuse the other party of that same weakness. DC was looking very heavyweight yesterday and so I expect that the same has happened, just like we get someone on here after every PMQs who will see brown making an error and accuse DC of it, even if non-sensical. 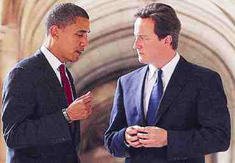 One has to ponder who briefed Obama on David Cameron and Conservative policy in general? As well informed as a senior politican like Obama is, he just would not have had the time to build up a opinion on the leader of the opposition. So perhaps the lowdown on David Cameron came from people close to our government? Anti-Eurosceptic is he? That should take some of the shine off of him, sounds like a menace to me. Victory to NuLabour then because we are now discussing such obvious drivel when the Government are more or less impossing a police state on us. Let's face it - Obama has risen from being the immigrant son of a single mother to the highest office in the world through brilliant organisation, sound political judgement, and sheer talent. His Chicago speech taking absent black father to task for not raising their children was a huge leap forward for race relations. On the way he was the youngest editor of the Harvard Law review. He has clear talent. It would not surprise me it he saw Bullingdon Dave, obsessed with PR (hoodies, huskies, hug a windmill), never having achieved anything of note (2.1, failed to get a job in consulting, drifted through cco after nepotism), behind the curve and out of his depth on the economy - "we'll spend as much as nulab, oh no we won't" - and viewed him as an irrelevant figure driven just by personal ambition, lacking conviction, and unlikely and unable to achieve any change. Lightweight sums it up well. I wouldn't criticise Obama yet. I rather doubt this story is true for the reasons Jonathan mentions above. I wonder if Mcintyre wrote this at the behest of that other New Statesman paragon of objective journalism Kevin Maguire? Find yourself some guts, 'tru Tory', if you're going to put up a post like that above at least have the courage to post under your real name. You wouldn't want the readers of this blog to think you're a snivelling little coward would you? This is clearly the NS making it up. Obama doesn't make those kinds of comments to people who would leak them. It's completely out of character. American journalists really do have better standards than ours. The timing of this supposed gossip tells me all I need to know about its veracity. If this information had come to light a couple of days after the event, I might have given it half a glance - but not now. Unlikely because Cameron is far to able to come across as lightlight in a meeting with Obama. He would have thought long and hard about what his first impression would be. There'll be nothing lightweight about him when he's PM. Out of the two, I think Cameron is actually more heavyweight. The President Elect's team can quickly deny the story if it is untrue. His team would not want a rift like that between Bush and Howard. If the denial does not come within 24 hours, the story is probably true. This story probably came from Alistair Campbell or Mandy. We will see how good Andy Coulson really is over the next few months. Whether what Obama is reported as saying is true or not - and clearly it's debatable whether Cameron is liable to that charge or not - who cares what America thinks anyway? The judgement of anyone in a country which can elect someone like Bush twice seems to me valueless. More propaganda from Mandy - why is anyone giving this the time of day? Mr Pot, meet Mr Kettle. Malcolm - given the way control of the party has been consolidated after the Cameroon coup(A list, Euro selections, taking special measure against constituency parties etc., there is no longer a functioning democracy within our party and it will be fairly obvious why people use pseudonyms. What part of the post do you factually dispute? Obama has a record of exceptional achievement unmatched by Dave. chalk up another who cares. It is unfashionable but I cannot see how people can be judged other than by their achievements rather than what they say. .
David Cameron’s successes, outside Eton and Oxford, have been limited to becoming leader of the Conservative Party. Other than this, his achievements have, so far, been precisely zero, zilch or precisely nothing in contrast to many in their early forties who have started thriving SMEs, run large capital projects, become respected medical consultants, commanded Army battalions in Iraq etc. So, to date, he has been lightweight, very lightweight. If the Tories lose the next GE, nice Mr Cameron will sink without a trace, a Tory “has been” who never held office and is unlikely to again achieve any political appointment of significance. If the Tories win the next GE he will find himself PM in the middle of the largest national economic crisis since WW2, at a time of internal strife and with a major terrorist threat aimed particularly at the 2012 Olympic Games. Then we will find the true metal of the man and in might be a case of “come the day, come the man” as he rises to the occasion like a latter day Prince Hal. I hope so but I can find no reason to be optimistic. C'mon Malcolm - having bandied around phrases like "snivelling little coward" you could at least have the courtesy to make a factually based contribution. or are you just an unthinking attack dog without an opinion? Let me make it easy for you - what was Dave's most important personal achievement prior to being elected leader? "Other than this, his achievements have, so far, been precisely zero, zilch or precisely nothing"
Oh I don't know ... didn't he help preside over the loss of £1.3bn of value in ITV Digital when he worked at Carlton? That's quite an acheivement! Seems fabricated. Never heard Obama say such things even in the primaries. It's obviously not true, I mean how much experience does Obama have? The shortcomings of Bush and Palin aside, do you not think that the balsa light Barack Hussein Obama has not had something of a 'politically correct routeway' to the top table himself ? "Sock Monkey" - wasn't that one of Dave's contributions to ITV Digital? It is not lightweight but dishonest that worries me most about the Cameroons. Look at the shockingly dishonest attack on the recapitalisation plan by Osborne on conservatives.com today. Quoting the Lloyds chief to explain why it has failed. This is the exact plan, that just after it was implemented (ie he saw how it was implemented and approved), Osborne publicly claimed credit for being the author of. Now it has gone sour, as many of us predicted, he is blaming Brown for implementing it. 'politically correct route way' to the top table himself ? a)the Editor of the Harvard Law Review is not a pc position. It is intensely academic and driven by peer review. d) His defining speech was the one when he challenged the black community to take responsibility for their own actions, and took a swing at absent black fathers - hardly pc, on the contrary. Obama is reported this week to have a dislike of the British, based on perceived colonial oppression of the Kenyan people. Given that Obama's father sadly conformed to a certain stereotype, and abandoned him during early childhood, should that dislike not be directed somewhat closer to home ? On the way he was the youngest editor of the Harvard Law review. Fourteen editors (two from each 1L section) are selected based on a combination of their first-year grades and their competition scores. Twenty editors are selected based solely on their competition scores. The remaining editors are selected on a discretionary basis. Some of these discretionary slots may be used to implement the Review's affirmative action policy. As others have said, why has it taken six months for this story to see the light of day? I think I may detect some Mandelsonian "spin" at work here. ToMTom - he wasn't just an editor, he was elected the President, by the other editors. Not a quota role so please withdraw your accusation. The law review president's election is a fussy affair, part intellectual debate, part frat house ritual. Obama was one of 19 candidates. As the 61 editors not running for the job debated the merits of the candidates behind closed doors on a Sunday morning in late February, the hopefuls cooked them breakfast, lunch, and dinner . Every few hours, the editors winnowed the list further, until just after midnight, when only Obama and a 24-year-old Harvard graduate named David Goldberg remained contenders . At about 12:30 a.m., the editors called Obama into the room, told him he had won, and broke into applause. Lets debate something worthwhile this post has just highlighted the story which is the aim of this drivel and allowed the moaners to bring out their handups about Dave C. Next they will be calling for Mr Charisma himself John Mr Spock Redwood as leader. I agree this is New Labour spin but it could be damaging - it is already the top story on Yahoo newsfeed..
And in an age of snippets of "news". The motto of my alma mater is Veritas and since I know exactly how things work at Harvard I shall simply comment that it is no more important than being editor of cherwell at another famous university. Really "tru tory" you must get out of your adulation of Harvard graduates - we are mortal and you do not need to kiss our feet. "Fourteen editors (two from each 1L section) are selected based on a combination of their first-year grades and their competition scores. Twenty editors are selected based solely on their competition scores. The remaining editors are selected on a discretionary basis. Some of these discretionary slots may be used to implement the Review's affirmative action policy." Even if Obama became a HLR editor on the basis of grades/competition scores, being the "youngest ever" would surely be only a matter of accident of birthdate unless Obama entered Harvard more than a year ahead of schedule? I note that he was born on August 4 - placing him on the cusp of two academic years but not making being put in the higher one particularly unusual (as an Aug 2 birthday person I speak from experience but have always realised that it would be silly to boast of graduating at 20 etc etc etc). In fact, being youngest editor is not his HLR claim to fame (he couldn't possibly have "won" this accolade as he had a 5 year gap between his BA and starting his LLM at Harvard and was 28 by the end of his first year at Harvard. It is as first Black President of the HLR. James McIntyre is a desperate NuLab propagandist. Google his previous contributions. To who did Obama allegedly slag off DC? British civil servants? Yeah right. His closest aides? Why would such a disciplied corps leak it? Just because it's possibly spin, and Mandy spin at that doesn't necessarily make it any less true I am sorry to say! True or not, I wonder if it was wise for Dave to make a gift of some crappy CDs. Compare them with Hague's contribution, which was a book on Wilberforce which he had written himself ! If Obama did say this (and it is unconfirmed) it would be a bit hypocrital of him. His 'underprivileged background' is a little exaggerated, his father had a master's degree from Harvard, he went to a prestigous private school (albeit on a scholarship) and being a 'community organiser', his major non-political career, although commendable is hardly sending shockwaves through the business or professional worlds. I have no doubt he is very bright, but not as bright as Hillary, so is he really so much more of a statesman than Dave? Tru tory. I am just an ordinary activist/councillor and do not feel the need to hide my identity because it might deprive me of an A list position. I happen to believe that David Cameron has been a very good leader of the party, has made it more united and more likely to win an election and actually do something. What Cameron did at University is entirely irrelevant in my opinion. Obama's achievements might be remarkable but I'm not suggesting they're not but your puerile post here does nothing for the party I give up so much of my time for. Well, it's justice for all those silly Tories who were all enamored of Obama. Obama is a left-wing partisan. So he doesn't like the Tories. This is news?!? Obama will do whatever he can do to get Labour re-elected. But if anyone is a lightweight, it's not Mr. Cameron. Tom Tom - you are Camilla Cavendish and I claim my £5. Don't worry - as a Stanford Grad I hold no esteem for the chilly college in the the North East. ps. If you think the Harvard Law Reviwew is on a level with Cherwell you a sadly deluded. One is a respected academic jouranal widely read in the leagal field, the other is an ok, but nor great student newspaper run by a small bunch a hacks read only in Oxford..
Malcolm - I still wait a response to the substance of this thread - wheteher Obama may have viewed Dave as a lightweight. You seem obsessed by what Dave did at Univeristy (if that was the focus of my post then drugs and Bullingdon borishness would have been more prominant), and happy to bandy insults - in this case purile - but you have not addressed the substance of the thread, or my post - what Dave and Barak achevied prior to public office was very different. I still challenge you to come up with any factual support for Dave pre Tory achievements. Cameron ain't no lightweight. He took on Labour over Damian Green yesterday and did extremely well at ripping their dodgy arguments apart. Cameron is great at dealing with a bad situation, exactly the quality we in our leader. Would Cameron and Obama work together well? I think so. Is the NS story true? It sounds like bull. "As a senior Labour source said: "Obama will want to work with a united Europe, not the 27 divided nations envisaged by a David Cameron, William Hague and [the Eurosceptic backbencher] Bill Cash vision of Europe. Tory isolationism is the last thing Obama's new foreign policy team will want from London." Who are they to say what Obama's foreign policy team wants? The final sentence sounds like a schoolgirl bully line. 1) This has all the hallmarks of a sad hack job. The central argument is that the Tories ought to drop their 'nasty' euroscepticism in order to please Mr Obama. The Europhile arguments get more pathetic by the day. 2) That said, Obama is no great Anglophile. Notice that his centrepiece visit to Europe was to Berlin not London, and I don't doubt his views on the EU are as reported above. The upshot, even the most ardent Atlanticists may have to concede that the Special Relationship is over - Britain is one ally amongst many. Tru Tory. 'What Cameron did at University is entirely irrelevant in my opinion'.My earlier post. You then post 'you seem obsessed with what Dave did at Univeristy'. Blimey! If this is the quality of your debating skills it's better that you stay anonymous and let's hope you're never on the candidates list. I've no interest at all in what Cameron did prior to his becoming an MP I'm interested in the leader he is now, your utterly puerile insults do nothing to help our party . Do I think he said it? No, but if he did I have lost a little respect for him. He is quite new to the political scene and as yet he himself is untested. Regardless, if he said it or not, it's lucky I don't let the American President decide who I vote for. Its exactly because Dave is willing to admit to being a human being that I am going to vote for him. He had a past. Grief many of us had a past, he did a few things that a lot of students do. He did things that I did as well, big deal. There is nothing in Dave’s past that he should be ashamed of IMHO. Why is the British media so gullible? Martin Sewell (0930) must be absolutely right pointing to an agenda of the “liberal intelligentsia and its media friends”. They brand as “stupid”, “light-weights” and so on, George W Bush, Sarah Palin and anyone else who they feel don’t sufficiently subscribe to their totalitarian liberal-left agenda being imposed on us, which is destroying the basic foundations of society by undermining traditional marriage, right and wrong, restraints and individual responsibility, preferring instead our control by the Big State, and the UN and EU. On this last example, the reporting of Obama’s apparent pro-EU views proves the point and seems the main reason for the article and the “liberal intelligentsia” may be trying to bully Mr Cameron into line. But this shows that the election of Mr Obama increases the courage a Conservative government will need to take back our sovereignty as a nation. All this spin is getting worse since Mandelson came back. I am obliged to Resident Leftie for providing a case study on the methodology of the modern left. I was pointing out that the Liberal establishment likes to disseminate such stories to try to establish a viral "received wisdom" to the detriment of its opponents. The fact of the rumour can be referenced by people such as Carl Cameron, that is in no way evidence of truth. He is what we call "The Reporter". This is not the same as "The Source" which remains completely unidentified. Once someone challenges their received wisdom they ( I ) come in for abuse that we too are "stupid/ gullible/ "off the light of the visible sprectrum "etc. Contrast this with the "smoking bimbo" allegations agaist President Clinton. When they emerged, James Carville was all over the air waves, setting aside the liberal "Respect for Women" mantra and calling the women " trailer trash" and liars. Do you remember the "vast right wing consiracy?" The difference between the two is that that story was actually verified by the original sources of the information - the women concerned - who gave their testimony, and were ultimately acknoeldged to have been truthful. Carville and Hillary have never to my knowledge offered a retraction or an apology. Obama is heavyweight when it comes to reading off a tele-prompter. Apart from that he seems to have no convictions and gives mixed inconsistent messages all the time. I think the allure of Obama has also worn off in the States, after his slowness on acting on all isues. In terms of the EU disagreement. It is hardly suprising that obama wants a united EU body that he can manipulate. However for us that would mean we would be at the mercy of European market forces. People never seem to remember this but the pound sterling is far stronger than the dollar and Euro. £1 + $1.60!.. For a reason!. This also think is a direct reflection of Camerons decisive fiscal action on our deficit. Lets put it in proportion and see Obama's idealist political motivation. we have done the wise thing and preserved our currenct and are evidently better off for it. Now lets never join the buearocratic mess that is the European council. As for Cameron, no political figure has managed to win an argument with him. I doubt the on-the-fence sitting, leftist, liberalist, idealist, orator Obama could claim he is a heavyweight. Bring back Clinton!.